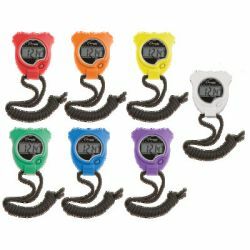 Features 1/100 second precision with lap counter (first 30 minutes); 12/24 hr format with calendar & time; daily alarm; hourly chime; and big digit display. Water & shock resistant. Set of 6 in assorted colors.